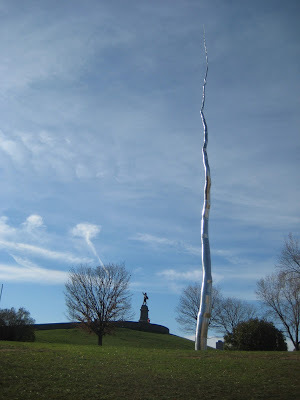 Some sculptures seen on my trip to Ottawa. ...I reposted my #50sog tweets. That is, my Fifty Shades of Grey tweets. I find it interesting that, like Twilight, after all the handwringing, this book is still shorthand for something in the wider culture, but the hype has died down to the point that no one seems to care about the book at all anymore. (Apparently I wrote something similar to this just last month, but I've already forgotten about it. ...I reviewed A Farewell to Arms. I feel like I read this book more recently than five years ago. It was the first (last) book from the 1920s to appear on The List. I still remember it very fondly!